Cushion BB or CC are now not only comes in skin shades. L'Oreal has step up to its game. 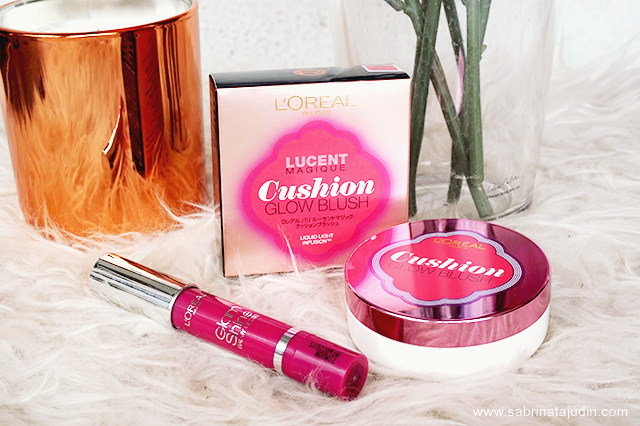 Today I will be reviewing 2 cool new products from L'Oreal and one of them is a cushion! but for the cheeks! At the end of this post also I will be showing you a makeup look using these products. A simple Pink themed look focusing on the cheeks and lips. All pink! I got these products from Hermo Malaysia. As you guys know they have expand and bringing more products from various brands including L'Oreal. 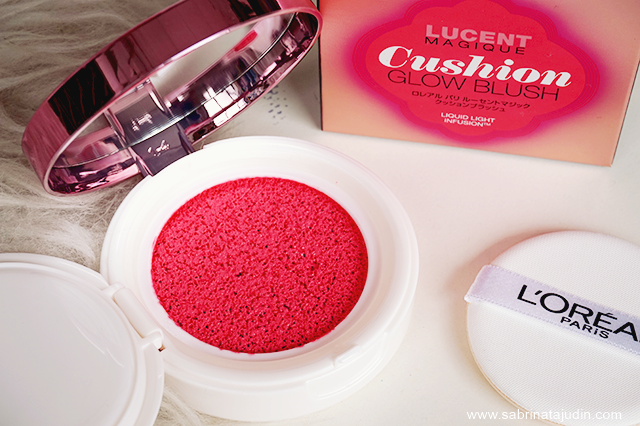 So first product I am showing you is this cool Lucent Magique Cushion Glow Blush from L'Oreal. I could say that this is the first ever Cushion Blush I ever seen and try. The packaging are similar to the normal Cushion you have seen in the market, the 2 layer case, the sponge and of course, the cushion which is filled with the product. This time, it is a blush. This Cushion Blush contains mineral water that has an advantage to give your cheeks that natural glow without looking patchy, dry or cakey. Pretty much like a cream blush but this is not as thick as a cream blush. You will need to use the sponge to apply this. On the pan it self it looks really intimidating! But actually this blush is so easy to blend. All I do is dot a few on my cheeks and use the sponge to blend it out. Mine is in the shade P2. This last longer than my normal powder blush!Shades available are #C1 Sunkissed Coral, #P2 Pink Fantasia & #P3 Rose Affair. Each Cushion Blush retails from RM49.90 each. 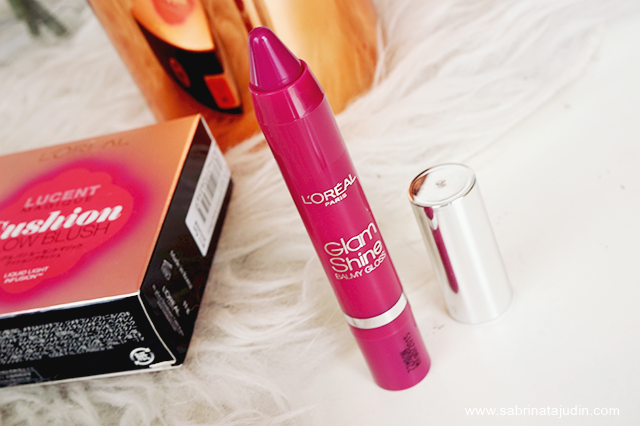 The second product is this, L'Oreal Glam Shine Balmy Gloss. A chubby balm stick that said to be the first glossy crayon that hydrates and keep your lips looking like you are wearing a glossy lip product but you're not. Of course, no stickiness when wearing this! It has a shiny finish and a sheer color . At the moment Hermo carries 3 shades which are #101 Rose, #102 Grape, #103 Cherry. Mine is in the shade #102 Grape. 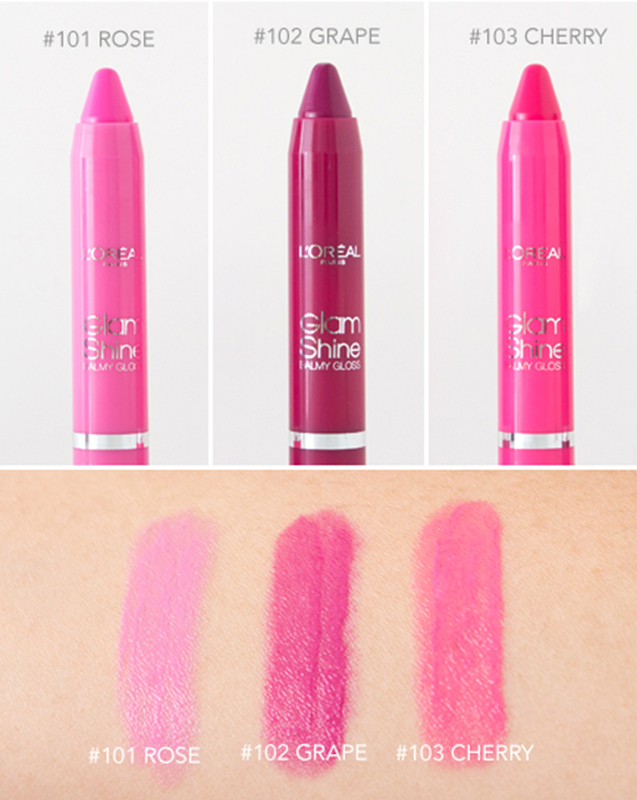 What I like about this lip product is that the tip of the crayon glides really smoothly. It does not dried up and the color is really pigmented. Each Glam Shine Balm retails for RM23.90 each. What do you think of these products, especially the cushion blush! I find that the cushion blush is really unique and fun to use. I love how it is not too hard to be blended and it looks really nice on the cheeks. Might wanna get more colors from the line! WATCH MY VIDEO ON HOW I USE THESE PRODUCT!